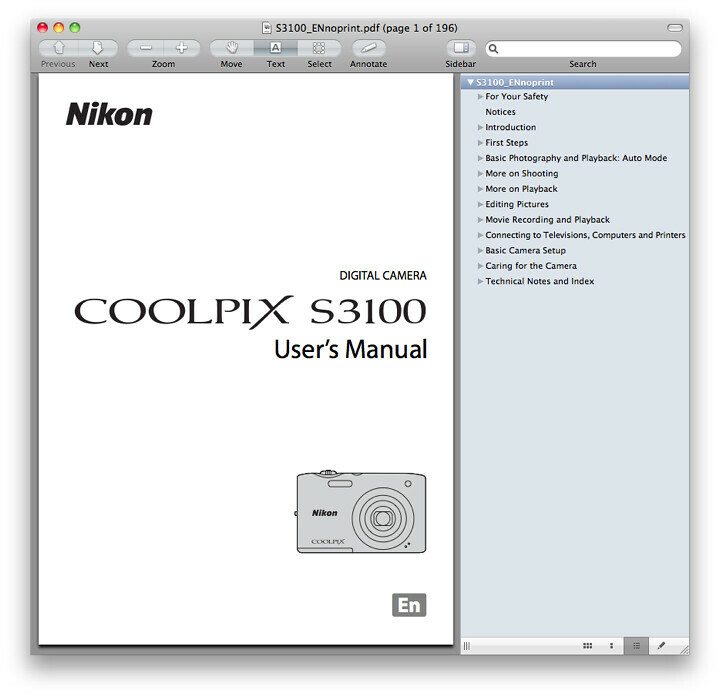 This 13 MB PDF instruction document (Nikon calls it the “Nikon S3100 Digital Camera User’s Manual”) for the Nikon S3100 should prove to be a fantastic read, all 196 pages of it, so be sure to download it. Both English Language (printable and non-printable) and Spanish (non-printable) versions of the Nikon S3100 Guide to Digital Photography / Camera Owner’s Manual can be downloaded at NikonUSA.com. For copyright purposes, the printable version of the Adobe Acrobat PDF document requires you to input your camera serial number and agree to a license, while the non-printable versions do not. 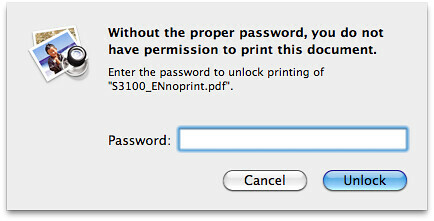 You’ll get the following dialog box if you try to print the password-protected, non-printable document. The guide discusses the features of the S3100 and how to use the camera. Page 32: Proper insertion and use of SD, SDHC or the latest SDXC memory cards. Page 171: Instructions for using the AC Adapter EH-62G (currently available at Adorama). Popular Nikon S3100 books and other printed literature and reading material in the Arts & Photography and Books section on Amazon.com.